Against the huge black curtains that served as the backdrop to the McAllen Convention Center stage Saturday morning, Adriana Cavazos’ bright red skirt stood out. Every twirl, step and hop was highlighted by the way her Jalisco skirt contrasted to the dark forum. Wearing a white lace blouse and red flowers in her hair, Cavazos, 16, performed a folklorico dance duet with Juan Reyna, her classmate at Weslaco High School at the sixth annual La Feria de STC: Folklorico & Contemporary Dance Competition. Their dance honored the style of folklorico from Nuevo Leon, a northern state in Mexico that is known for having a heavy polka influence with upbeat steps and lively music. They danced to the song “El Pavido Navido,” by Chalino Sanchez. Cavazos said that this performance was special to her because her grandmother, who was in the audience, grew up in Nuevo Leon. She also said that dancing has given her the opportunity to learn about the history of folklorico and of the reasons behind the steps and costumes. 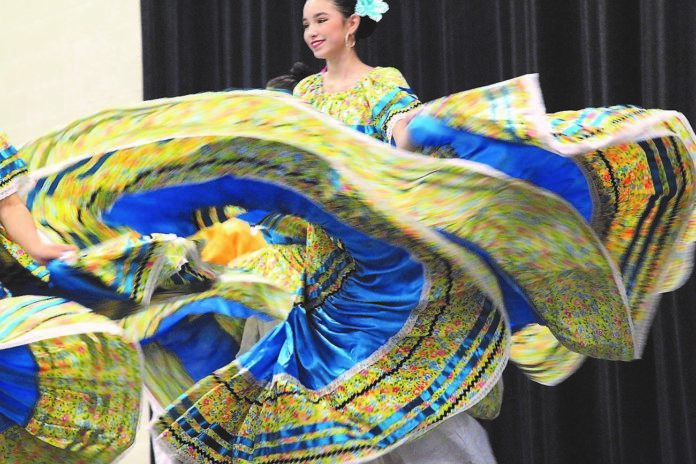 Cavazos’ hope is to continue dancing beyond high school and join the folklorico program at the University of Texas Rio Grande Valley after graduating. The event’s coordinator, Victor Gomez, who is the director of the center of Mexican American studies at South Texas College, said that he wanted dancers to take the weekend-long competition as a learning opportunity of the culture of their dances. This year, 40 groups competed, ranging from kindergarten to high school students from school dance groups and private dance companies. Though most entries were folklorico, the day featured contemporary dance as well. STC students were volunteers at the event. “It used to be just folklorico, but there is a strong movement for contemporary dance in the Valley,” Gomez said, who mentioned that later that day, hip-hop, ballet and jazz dances were in the lineup. Donning the traditional outfits of the Mexican town their folklorico dance originated from, groups were seen practicing in the hallways and lobby of the building, filling the air of the convention center with the sound of clicking dance shoes and heels. Dance groups this year came from all around Texas and across the border. Some ensembles traveled from Irving, Texas, San Antonio, Corpus Christi and Reynosa for the competition. Carrying in equipment from busses, children holding large boxes were seen practicing steps while walking up the sidewalk, making their way to the entrance. While a dance group took the stage, 8-year-old Dana Galaviz was practicing her steps at the back of the room, behind the judges’ table. Dancing with the Herencia de mi Tierra folklorico group of Leo J. Leo Elementary of Mission, Galaviz was wore a pink Jalisco skirt with purple grape clusters stitched on it. Her hair was accessorized with purple and green flowers, and plastic grapes that draped along one side of her head. Galaviz’s dance respected the folklorico from Aguacalientes, Mexico, a city located in central Mexico that is widely known for exporting grapes and wine. Competition ran on Saturday from 8 a.m. to 7 p.m., and will continue on Sunday from 8 a.m. to 9 p.m., which will feature the larger dance sections of the competition. The awarding ceremony will take place on Sunday.